MAKATI CITY, Philippines - On May 26, 2018 the parishioners of Sta. Teresita Parish held the Santacruzan traditional procession. The event began with a solemn Eucharistic celebration at 4:30 pm in honor of the Blessed Virgin Mary. Fr. Richard Magararu SMM, the parish priest, presided over the Mass with some Montfortian priests as concelebrants. The Santacruzan procession followed immediately after the Mass. There were twenty four sagalas (Queens) who participated in this colorful religious procession. The parish which is under the care of the Montfort Missionaries is promoting this beautiful tradition which is held during the month of May. The Santacruzan (from the Spanish santa cruz, "holy cross") is a ritual pageant that was introduced by Spanish Missionaries. It honors the finding of the True Cross by Helena of Constantinople and Constantine the Great. 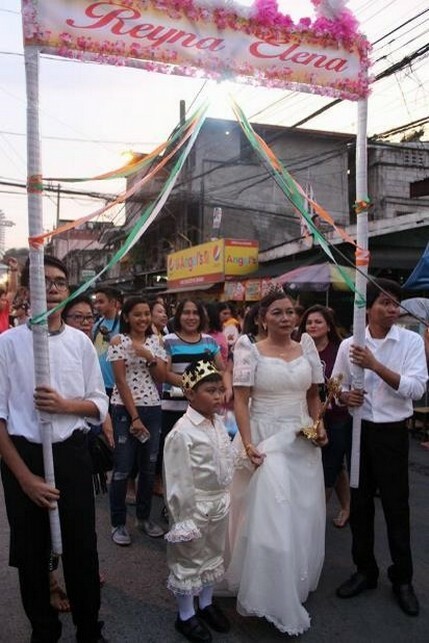 This is the reason why the main character of the procession is Reyna Elena, escorted by a boy dressed as a prince representing Constantine. The Cross and the statue of the Virgin Mary with the title “Virgen de las Flores” are highlighted in the procession. It has been a practice to combine “Flores de Mayo” which is a festival to honor Mary with “Santacruzan.” This explains the presence of many queens bearing the various titles of Mary. Among the Montfortians present on the occasion were: the newly arrived confrere from Indonesia, Fr. Heredi Suhartono SMM, Fr. Norwyn Baydo SMM, Fr. Arnel Pagaduan SMM, Fr. Federick Yumang SMM, and the scholastics. Hermosa, linda devoción y cuanta concurrencia. . . ! ! ! Bendiciones. . . ! ! !